This week’s episode features a small story that’s versatile and really delivers. It’s about a bathroom renovation of all things. Sometimes business stories can come from your personal life and make a good business point. The beauty of many of our personal stories is that they are often relatable. Similar things have happened to the listeners so the story is plausible and makes sense. This story is about appreciating the good work of others before being critical. It also says something about getting the full story before making too many assumptions. Lastly, it’s a nice illustration of having a partner who can help you reflect. Please let us know if you see other good lessons in the bathroom story. We are now settled on Monday morning Melbourne time to publish our episodes. That means our American listeners will get your show Sunday afternoon and European friends will see it Sunday night. Thanks for all your comments and ratings on iTunes so far. We are humbled by the support. Please keep them coming as it really does help others find the show. And please subscribe on iTunes or Android so you get the latest episodes as soon as they air. We will soon have a way to sign up to the podcast email list so you can be notified of when the podcast episode has been published. And anyone who signs up will automatically get a 4-part lesson on the essential tips for great business storytelling. We will keep you posted. Busy executive and wife are renovating their bathroom. Executive is travelling when bathroom is being completed. He walks into the bathroom and immediately notices unfinished grouting but no mention of beautiful bathroom. Back in bathroom husband says wow! and appreciates bathroom. Learns what’s happening with grout. Husband realises he does. Red pens everything. And I guess today is all about, like every other episode, exploring this whole world of business storytelling. In each episode what we try to do is share a business story and then explore why it works or doesn’t and some of the business scenarios where that story might be useful. Fantastic, and so it helps people build up their repertoire of stories. We want people to have a bunch of stories in their back pocket so that they’re ready to go when they need them. So, Mark, you’re taking off today’s story. In the last episode we started off by just explaining what a story bank is and why it might be helpful. In the course of that conversation it reminded me of a story that I collected in 2009 and used quite a bit for a couple of years but then for years I didn’t use that story even though it’s a really cool story. It wasn’t until last year when we were having a conversation and you mentioned, what about that bathroom story, and I went yes, and it was not in my story bank. So, this is the Bathroom story from 2009 and I was coaching a senior government executive called Steve and I walked into his office for a coaching session. And there was a big mind map on his whiteboard; top right-hand corner was the number one and bathroom story. So, I looked up and said, ‘come on Steve what’s that one?’ He said well I’m getting my leaders together because we’ve got a huge culture change that we have to make and I’m going to use this story to start off. What happened was that my wife and I have lived in the same house for many years and over time we’ve renovated that house to the point where it is perfect for us, we really love it but the master bathroom we could never figure out a design we really like so for years it’s kind of languished. Last year we found a designer that came up with a plan for the new master bathroom and we loved it, so we engaged a builder and started the renovation. I had to go overseas before it was finished and came back on the Friday night that the builders had promised us that it would be done so I was kind of excited. I came in the front door and my wife greeted me and she led me down the corridor and she threw open the door of the bathroom and I walked into our bathroom, brand new bathroom and I looked up into the top right corner and there was some grouting that wasn’t finished. I went what is going on, the grout, what’s going on there? My wife grabbed me by the ear literally, dragged me down the corridor, dragged me back to the front door, opened the front door, pushed me outside and said, ‘let’s try that again shall we’. So we walked back down the corridor and she threw open the door and I looked in at the most magnificent bathroom that was exactly as we planned it and exactly as I’d imagined, it was beautiful and so I said, ‘and the grout’ and she said, yep the builders knew it had to be perfect for you and it was too wet to finish the grouting today. They are coming back tomorrow morning. It will take them half an hour, those final touches. A little while later we were sitting on the couch having a glass of wine and my wife was a bit quiet and she just looked at me and she said, ‘you don’t do that at work do you?’ And I realised that I did. I was looking at the grouting rather than the bathroom. Somebody would work all weekend putting a paper together and the first thing I would do on a Monday morning when I got in, is grab my red pen. I’d literally pick up my red pen and start fixing it. I was totally focused on the grout. I didn’t look at the bathroom and that was a major lesson for me and I want everyone in my organisation to understand it. I love that story; I think it’s such a nice story. You think about what makes that story work. The things that jump out for me; first of all, its’ super visual right. I could see that hallway. I could see her grab you by the ear and pull you back to the front door. I could see him looking in the bathroom and seeing the grout problem and you know, just going for that. Its’ super visual right, the hallmark of all great stories. What jumps out for you, what do think is in there that makes that story really work? I think that the wife’s prompting lead him to that realisation. Just a very simple thing. And the other thing is that story’s just about a little thing that happened on a Friday night. That’s right. In fact, it sort of says to me there’s a whole bunch of things you could tell stories about but if you can pick stories that people have that experience. How many people have experiences of bathroom renovation, and things like that so immediately they become connected? It’s relatable right, whereas years ago I remember reading a story of Julian Orr, this fabulous ethnographer and he did a study of photocopy repair men and how they worked out how to repair big photocopiers. We are talking about the 70’s and when they were massive machines and it’s all about stories. The sort of stories they’d tell were things like, ‘ah Jim I was over at this particular client’s site and I got an E30 and I thought, E30 so I rewound the system and I put a few rings through and then it came out with a T22. Well you know a T22 needs a dyo change‘; anyway, it’s that type of story which only makes sense to another photocopy repairer, right? Whereas that story is more of a universal story. Yeah, ‘cause one of the things people judge your story on is by its relevance and so yeah the T20, X37 story is not relevant to many people. But going home on a Friday night. And I like the fact it sort of has different points in that story in that you tell the first part where he makes the obvious mistake and he gets to rediscover it. That could be the end of the story but what really makes it powerful is when the wife is then reflecting on his behaviour and just asks a simple question: do you do that at work? That’s when the big penny drops for him, that’s where he goes, oh my god I do. And without his wife’s prompting that moment might have passed without notice and it’s about the importance of the point of reflection. Its’ not the moment of action where the learning occurs, it’s the moment of reflection and it’s his wife was the one that prompted that moment of reflection. It’s such a useful story and we’ll talk about how we’ve used it, but it would have been lost if his wife hadn’t made the observation. Another element to that, again I think this is when you know you’ve got a good story and that’s when you can use the language in the story as a metaphor for things that are going on. ‘I saw the grout not the bathroom’. And then people in the conversation at work are saying ‘you’re just seeing the grout’ right, ‘look at the bathroom’. A metaphor, shorthand for meaning. And for that story. So, you don’t have to say. This actually happens when you have a really powerful story in an organisation, they don’t ever have to tell the whole story. Yeah don’t do a Pedro and everyone knows the Pedro story, so its’ that type of thing. I think that’s a lovely element of that story. When would we use this? Where are the great places to use it? I’ve started presentations where I’ve got a very doubting audience and I’m concerned that they are going to nit-pick and just tell that story and I go so today lots of opportunity for us to focus. 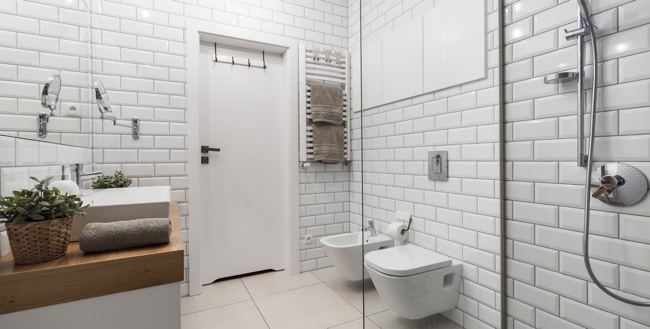 You can choose to focus on the grout or we can look at the bathroom. And I’ve used it once where I was at a big Merchant bank sort of business and I had these people doing a review of a project and they were spiralling. You know they were spiralling into that grout. And I said hey guys just before we go any further I just want to share something with you that might give you a different perspective and I shared that story. It was so interesting the quick change. I didn’t have to tell them what it meant or anything like that. I just told that story and actually if I remember correctly it didn’t come up, as out of the blue as it might sound like. I think someone mentioned at the beginning of the conversation that they were doing renovation and somehow it was linked to that, so it seemed a little more natural than just plonking it. It would feel a little bit weird if you just plonked a bathroom story in the middle of a business conversation. Although the way you positioned it when you said how you’d used it, that made sense, folks, let’s just take a breather for a minute, I want to give you a different way of thinking about this. Again, you were talking about banks, I was chained to some bankers, actually I was teaching a group. This one lady looked at me and said, ‘oh my god, my boss is a story teller’, like she hadn’t recognised it. She then told me another renovation story where her boss stood up and said ‘hey you all know I’m doing the big kitchen renovation at the moment and my husband and I get together with my son and we look at the budget. We realised we couldn’t afford what we wanted’ and so it was essentially all about paring back and she used that then, as sort of an analogy for what they had to do with that organisation, because they were asked to pare back. You have to be careful exactly where you use those sorts of stories. This lady had obviously that rapport with her division. Everyone seemed to know she was an extroverted sort of person and so when she told the story and linked it to what was needed in the business, instead of fighting it they were sort of going, okay, so how do we do it? It was a very positive, like what are the next steps? That’s what I like about that bathroom story is that there are so many circumstances where people naturally take the negative. That’s what humans do for the survival of the species. It is safer to assume the worst because you avoid danger. So, lots of situations where people will look at the negative first. That story has a lot of versatility and so if you are with a group like the group you described. If they’re spiralling down into the pond of negativity you’ve got two choices. One of them is to say, come on folks let’s not be negative which is a push strategy and people will resist you. What a lovely positive way to get them to reframe their thinking just using the story. Yeah, I think you’re right. Absolutely. So, is there anything else we can pull out in terms of business points out of that story? Is there something there about having that time to have conversations? Well, if you wanted people to sit down and reflect after events you could tell a story and then go here’s an example where you could have easily missed that entirely, but it was that point of reflection, so you could do it there. I think that’s nicely covered some of the key applications and I just love the fact that it’s a tiny little event, no saga, but has potentially a big impact. So, we like to finish these episodes with a bit of a rating, given the pantheon of stories you have in your back pocket, how would you rate the bathroom story? I’d give the bathroom story; I’ll go eight. You know I was even thinking nine but I’m going to go eight and a half. It’s a very useful and good story to tell. Well that ends our episode today and you know what I’d really like to see, if they saw other uses for these stories. If they can go into the comments sections where all our episodes are described on our website; just give us some feedback on it ‘cause I think that would be really useful. Also, please throw in any questions you have. There might have been something that popped into your mind and you think I’d really love to hear from Mark and Shawn and we’ll cover that on a future episode. We’d love to get you to go to iTunes, and I know I keep saying that, but please go to iTunes. Leave a comment. Leave a rating; it just helps the word to be spread. Let’s just think about it guys, this is now up to you. It is so important now that you go and find these great stories and put them to work. Brilliant story … with a great message … very easily remembered. Love the grout story – and love the podcast. Thanks guys – this is seriously useful stuff! It is also a story about “focusing”, managers and leaders need to keep perspective, 80-20. Also- timing- when do you actually talk about the “grout”? Motivating and engaging- also vis a vis giving feedback. I also felt that it has a larger more “feelings” aspect to it- are you going to let a little temporary grout get in the way of the larger picture? I liked the fact that it is a wife-husband story as well, leans into relationship communication. Thanks for the story and dialogue! Love this story. It’s so relatable for the managers I work with. I’ve shared it in two coaching sessions this month and it’s the thing that most resonated with both clients from the sessions. Yes, we love this one too. Glad it has been useful for you.